Imagine a workplace without fear, stress, or worry. Instead, you're acknowledged as a valued, contributing team player who doesn't sacrifice priorities, values, happiness, or your life for your job. Sound ludicrous? Consider this is a reality in many thriving organizations. What if you can successfully coach anyone in 15, five, or even 60 seconds using one question? Sales Leadership makes delivering consistent, high-impact coaching easy. For busy, caring managers, this removes the pressure and misconception that, "Coaching is difficult, doesn't work, and I don't have time to coach." Since most managers don't know how to coach, they become part of the non-stop, problem-solving legion of frustrated Chief Problem Solvers who habitually do other's work, create dependency, and nourish the seed of mediocrity. Using Keith's intuitive LEADS Coaching Framework™, the coaching talk tracks for critical conversations, and his enrollment strategy to create loyal, unified teams - you will inspire immediate change. Now, coaching is easily woven into your daily conversations and rhythm of business so that it becomes a natural, healthy habit. ©2018 Keith Rosen (P)2018 Audible, Inc. Finally, an easy way to develop the most important habit of leadership - the habit of great coaching! 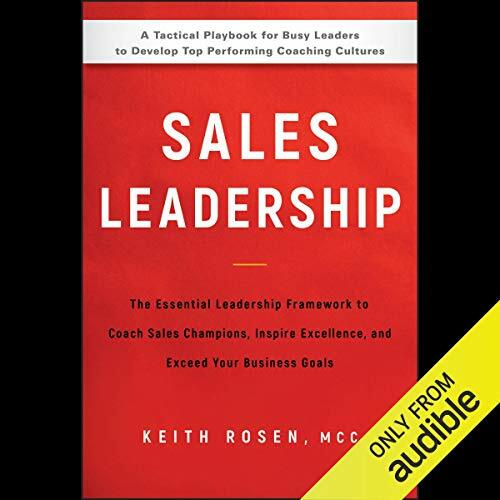 If you really care about your sales team and meeting your targets, listen to this audiobook. Packed with practical information and templates to guide you from another Sales Manager into a Sales Coacher that inspires his people. This book provides the guidance of applying best practices, in a way that promotes the benefits of coaching and personal development. If you are interested in creating a coaching culture, this is a must read!